Kerry and her team welcome you, your friends and family to the restaurant/clubhouse here at fenland. We are a friendly welcoming team. All of the items on the menu are freshly prepared to order. If you have any dietary requirements please make us aware as we will try our best to help. Daily specials are available too, so please ask the staff for details. On Sundays we also offer a three course Sunday lunch menu including coffee. We also offer a takeaway service. 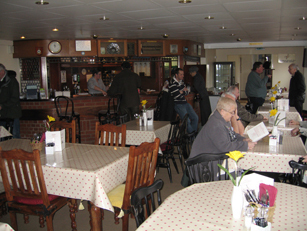 The Fenland Clubhouse is available for hire to individuals & organisations and for meetings, parties and gatherings for a small fee, seating around 50 persons – food & refreshments available from Kerry.